With their trademark masked eyes and ringed tail, the easily identifiable raccoon is quite common in most areas of the US. This member of the bear family typically weighs between 10 and 35 pounds and are 2-3 feet in length. 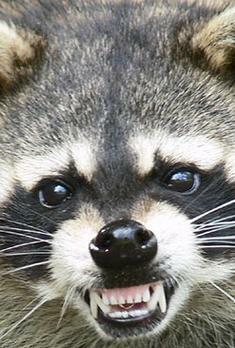 And while first impressions may suggest the beautiful, furry raccoon might make a great pet, beware! If you spot a raccoon during the daylight hours, you’ll want to immediately call the techs at Minnesota Wildlife Animal Management without approaching the raccoon. 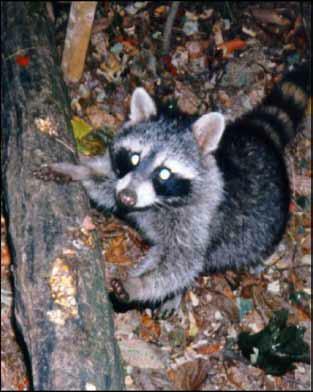 Because they are nocturnal, a raccoon sighting during the day could mean the raccoon is sick or injured. Raccoons can carry diseases and while not normally aggressive toward humans, they are known to be protective of their young, and are known to attack household pets. Be safe and call Minnesota Wild Animal Management for Professional Raccoon Removal in Woodbury, MN. Why is it so difficult for us to live in harmony with raccoons? Mainly because raccoons are omnivores, meaning they eat plants, animals, and just about anything else they can get their hands on. And on the topic of hands, their fingers are clawed and dexterous, meaning they have the ability to open doorknobs, untie knots, and rip open nearly any type of container if they suspect a meal might be inside. And finally, raccoons are primarily nocturnal, so under the cover of darkness they are causing damage in your yard as they raid your garbage cans and gardens. 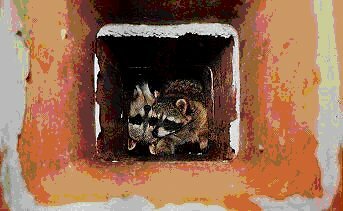 And as if all that isn’t enough, raccoons sometimes choose to den in chimneys and attics, and given their strength, can quickly gain access to your home. In many areas of Minnesota, the local ordinances protect raccoons, so prevention is one good method of staying on top of the raccoon population on your property. The best ways to prevent raccoons from damaging your property are to store trash cans in sheds or garages. If this is not possible, then for outdoor trash cans, firmly close trash can lids and use strong wires to secure them tightly. For some, it may be necessary to tie the trash can to a sturdy pole or tree so that they can’t be tipped over by raccoons. To protect garden areas, wire fencing surrounding garden areas could work, but raccoons are adept at climbing, so electric fencing is suggested, though not always practical. Patching holes that give access to attic spaces are the best way to keep raccoons from reentering. If you suspect that raccoons are lurking on your property, call Minnesota Wild Animal Management at (612) 237-8282. After a thorough inspection, we will take steps to humanely remove the raccoons. Once the raccoons have been removed, we can work on repairing any damage that has been done to your home, and take preventative measures to keep them from returning. For our Emergency 24 Hour Wild Animal Service, call anytime at 763-232-7296 or 612-237-8282.